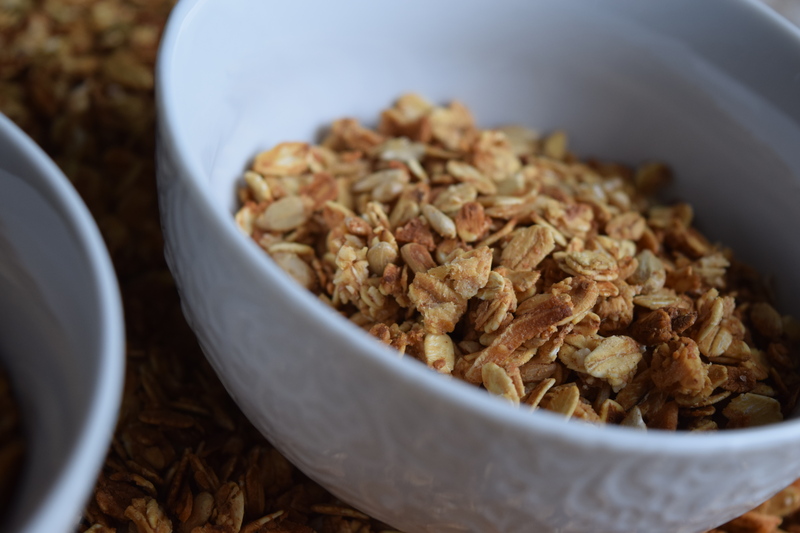 I love me a good old bowl of homemade granola! It's simple. It's fast. It's delicious. It's healthy. Make yourself some today! I know honey isn't technically vegan so if that's a concern then feel free to use maple syrup. If you have celiac and need to avoid gluten then please make sure to buy oats that say Gluten-Free on the package (oats are naturally gluten free, however they are usually processed in a plant that also processes wheat which means they could be contaminated). Store the granola in the freezer for the ultimate freshness. Sprinkle over oatmeal, add raisins and berries and you are on your way. Hey now, hey now, this is what dreams are made of (a throw back to Hilary Duff, anyone?)! Mix honey and apple sauce together and set aside. Lightly spray two large cookie sheets with cooking spray. Add all dry ingredients into a large mixing bowl and stir until combined. Gently fold honey and apple sauce into dry ingredients. Spread mixture between the two cookie sheets.